Long span trusses are 60' or greater in length. A long span truss can pose a greater risk to installers because the dimensions and weight of the truss itself can create instability, buckling and collapse of the truss if it is not handled, installed and braced properly. Long span trusses can be installed safely and efficiently but they require more detailed safety and handling measures than short span trusses. 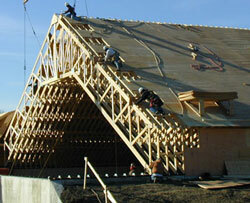 Technical Evaluation Reports or Research Reports for Long Span Trusses are available in the list below.